The views of the Founders are varied on the nature and extent of federal legislative power. But, is it a coincidence that the seat of the federal government wound up in the middle of a remote, hot, humid and mosquito-infested swamp about which some of our earliest public servants grumbled greatly? Consider, too, Article I, Section 4, paragraph 2, and Section 5, paragraph 4 of the Constitution. The first commands that Congress must convene “at least once in every Year”; the second, commands that, when in session, neither House may adjourn for more than three days without the consent of the other. These provisions seem to anticipate a mode of public service and a periodic government power often associated with Monty Python. Tomorrow (Wednesday) at 8PM, Home Box Office (HBO) offers something completely different as it airs The Senators’ Bargain on HBO2. * The show explores the most recent and unsuccessful effort at immigration reform in 2007, following the rise and fall of legislation proposed by the late Senator Edward M. Kennedy (D–MA). The Senators’ Bargain is the last installment in How Democracy Works Now, a 12-part series on immigration reform since 2001, produced and directed by documentary film-makers Shari Robertson and Michael Camerini. ** Started in the summer of 2001, the thought was to produce a single film that would trace how an idea—comprehensive immigration reform—becomes a law. And then: 11 September 2001. The political landscape changed and ideas about our borders, our security and our government were profoundly affected. Ms. Robertson and Mr. Camerini decided to see where all this would take them, following a growing and changing cast of characters and ideas across the country and gaining unparalleled access as the immigration issue transformed over the next six years. How Democracy Works Now follows Congresspersons, advocates, trade and church groups, staffers, consultants and concerned citizens as they try to shape immigration reform into law. It films everything from back room negotiations, marches and endless telephone calls to Senate floor debate, town hall meetings and press conferences. The result is a series that offers a sustained and multifaceted look at the democratic process through the lens of comprehensive immigration reform from near its inception at the beginning of the administration of George W. Bush in 2001 to reform’s ultimate collapse in 2007. What is perhaps most remarkable about The Senators’ Bargain is how close one feels to the action and how personal this often giant, seemingly distant and media-saturated process of democracy feels. As the Senate wrestles with Senator Kennedy’s proposal, we see negotiations and legislation unfolding; we follow Senator Kennedy, the moral still point in this film’s turning world, as he trundles from office to office; we listen as Frank Sharry, Founder and Executive Director of America’s Voice, cajoles White House staff and strategizes and decompresses with staff and allies; we watch a tired and tireless Esther Olavarría, Senator Kennedy’s Immigration Counsel and now Deputy Assistant Secretary for Policy at the Department of Homeland Security, as she shuttles hither and yon, balancing briefing books and competing perspectives; we sit in the office of Senator Robert Menendez (D-NJ) as a group of immigration advocates, like Justin Martyr before Antoninus, attempt to stay (or is it induce?) the increasingly inscrutable Senator. The camera is filming persons, places and conversations rarely filmed. In some cases, the spaces are so tight, the action so varied, the camera swerves as it is knocked and adjusted, the filmmakers trying to capture a developing scene. It can be momentarily disorienting. But, re-focused, one rarely has the sense that the players being filmed are aware—at least excessively aware—of the camera in the corner. That oxymoronic sense of anonymity and intimacy that marks fine documentary film about the living is patent. When asked why HBO wanted to air The Senators’ Bargain, an HBO spokesperson said, “HBO likes to take viewers places they’ve never been before.” And so The Senators’ Bargain does. Timing could hardly be better for a series exploring the legislative process and immigration. As comprehensive health care reform tilts toward completion, the issue of comprehensive immigration reform re-emerges. On Sunday 21 March, while the United States House of Representatives spent the day passing health care legislation, marchers filled the Mall in Washington, DC to voice their support for comprehensive immigration reform. President Barack H. Obama has re-iterated his commitment to comprehensive immigration reform, linking any legislative effort to support from Republicans. In an article in last Friday’s The Washington Post, Senator Charles E. Schumer (D–NY) and Senator Lindsey O. Graham (R–SC) outlined their proposal for comprehensive immigration reform. Senator Graham has noted that continued Republican support depends on whether Democrats choose to proceed on health care reform through reconciliation—a move Democrats will pursue this week. I wish we had led the second term with immigration reform...Immigration reform would have given everybody a bipartisan victory and would have cleared the ground for entitlement reform. At the same time, public knowledge, trust and discussion of the political process have reached historic lows. Media coverage of issues seems to have adapted to the crush of the 24-hour news cycle with numbing and shallows. Rather than using around-the-clock airtime as a means to explore issues in depth, media’s focus on the bombastic surface of the most obvious issues, characters and opinions only makes more stark the disconnection between those who make the laws, those who make the news and those who constitute the Body Politic. Into this mess step Ms. Robertson and Mr. Camerini. The Senators’ Bargain takes place mainly in the Capitol building, whose exterior projects a majesty that masks the labyrinthine closeness of its interiors. It is a place in which the uninitiated can get lost as easily as find their way. And it does not always help to ask the friendly and plentiful Capitol guards to guide you. Their familiarity with these passages is often the result of their assigned post, the passage of time and a willingness to explore. The Senators’ Bargain documents the battle over legislating on immigration. In doing so, it shows much more as it captures the complexities and complications of a process and a people. While immigration reform did not succeed, The Senators’ Bargain is a fine guide to law’s labyrinth and How Democracy Works Now achieving its goal. GOVERNINGWorks interviewed Ms. Robertson and Mr. Camerini at the beginning of March. To read the interview, please visit GWorks Interviews: Camerini Robertson. * The Senators’ Bargain airs tomorrow (Wednesday 24 March) at 8PM on HBO2. 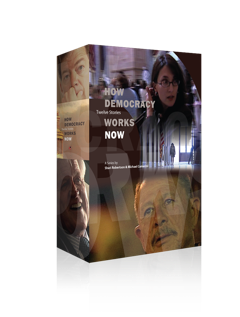 In addition, HBO will make The Senators’ Bargain and two other episodes from How Democracy Works Now available On Demand. For more information on HBO’s broadcast schedule, please visit The Senators’ Bargain at HBO Documentaries.